Book tests are a staple in the repertoires of mentalists and are very effective in a performance of mentalism (see David's Bookworm Act ). However, for magicians the effect can be rather lack luster as nothing visual happens. There is very little or even no "magic" when it comes to a standard book test. David Devlin's Contact is not a book test in the traditional sense. It is a book test designed for the magician. It is a book test of sorts with a séance themed presentation. It is through the book itself that the performer will make contact with the "spirits". The presentation is rather spooky; however your presentation does not need to be bizarre or as part of a séance. It can be performed as straight magic. It can be done close up or on stage. And best of all, the book can be given away to a spectator as a keepsake! The secret will never be found. It might be seen, but it will not be found. On the table are a book, a small pencil, a slip of paper, and an envelope. The performer talks about spiritualism and contacting the dead. The envelope is shown to be totally empty. It is explained that it is necessary to give the spirits a point of reference, something to use in order to manifest their presence. In this case, a word will be used. The book is picked up, and a page is selected at random. The page number and the first word on the page are noted. The book is closed and handed to a spectator. It is now explained that the spirits will only present themselves in the dark. The envelope is shown to be totally empty. The spectator places the pencil in it. It is then sealed and set on the table. A silent moment passes. Suddenly, the envelope literally jumps! The performer picks up the envelope, tears it open, and looks inside. "Oh, my God." he says. Something has happened. The spectator is instructed to open the book to the selected page. He does so, but finds that half of the page has been torn out! The envelope is turned over and its contents fall out. First the pencil, and then the torn page. The spectator picks up the page, and not only does it match the torn page in the book, but scrawled on it in pencil are the words, "I AM HERE"! The book is not taken apart and reassembled to prepare it. 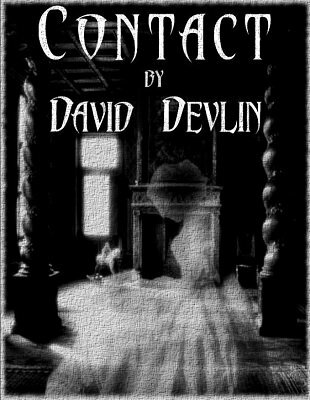 Also, if spooky magic is your thing, check out David's eBook Haunted .